What Guides Never Want To See!! What Guides Never Wants To See!! This is my thirty-second story and it has been a year since H.A.R.M. went on line. I am happy to say the response has been great, reaching over 770 cities and 92 countries. For you new subscribers, if you haven’t read some of my earlier stories you might want to go back and check them out. Some say the older ones are the best. I’ll let you be the judge of that. I have also added a Search Bar for the site which will allow you to check on story contents, individuals in the stories and more. As I’ve said before, if you enjoy the site please share it with your friends. Thank you for your support. It has been fun reminiscing about the old days. Now for my story. Many bad things can happen when you are guiding around water, especially when you are guiding for large animals like moose or brown bear. Like most guide operations, AAA Alaskan Outfitters has had their share of bad endings. I know many of you have had similar incidents or know of someone who has. I thought you might get a kick out of seeing some pictures of those “bad endings.” This is not the total by any means but is a good representation of some we had to deal with. Some of the captions with the photos will explain how each situation was handled. These pictures may give you a good laugh or bring back memories you would just as soon forget. Steve Vaughn, GA, with his 9'6" brown bear. I was guiding Steve when I worked for Rich Guthrie in '83 down at Cold Bay. I must say because of the weight of the water in the bear's hair, my pack was heavier with this bear than many of my 10'+ bears. When you're in the swamp you can't kneel down so you can't do a good job skinning which also makes it heavier. 1986 - My partner Dan in the water and Mike Herbert trying to rope the antlers so they can pull the moose to shore. This was AAA's first water recovery. Looks cold to me! Dan said the moose floated until it touched the bottom. This was a small lake next to Big Bend Lake in the Wrangell Mountains. The hunter was Les Scaramella from CA. Hmm, what we do for our clients! Jack Dodds, CA, with his 9'8" brown bear taken right behind our Otter Lake camp the spring of '91. Jack was guided by my partner Dan. That day, I assisted with both guiding and recovery. Jan Seski, PA, with his 67 1/2" moose he shot with his bow in '93. It picked a bad place to die. Jan's guide was Paul Chervenak. This was below the Dog Salmon River Lodge. Woody Woodard, OR, pointing to where he shot his 9'4" brown bear from. His bear was taken in '93 about 15 yards from where Jack Dodds killed his in '91. They shot their bears from the same spot. Both bears were "big bears" for the Western Alaska Area. Woody's guide was my partner Dan. Tom Brunitt, MO, with his moose in the King Salmon River. Mark Confer guided Tom and I dropped a packer off to help him finish up on the moose. The water kept coming over the moose and their hip boots making it more difficult. This was in our Otter Lake area in '94. Mal Malacarne, PA, with is 61 1/2" moose in a small stream at the "burial grounds" at our Dog Salmon River camp in '94. My partner Brent was the guide. Dennis Wingrove was packing for us that year and helped Brent. Brent said the meat cooled quick and stayed really clean. 1994 was a bad water year - 2 moose and a "Super Cub." Just thought I would throw this in here. If you haven't read the story it is "Cub In The Lake." Don Renard, WI, with his moose in a beaver pond next to the King Salmon River. Don's guide was Steve Lanphier. Bob Wambach, who was guiding Don's son helped Steve in the recovery. They broke up a beaver dam to drain some of the water. This was in '95 at our Otter Lake area. 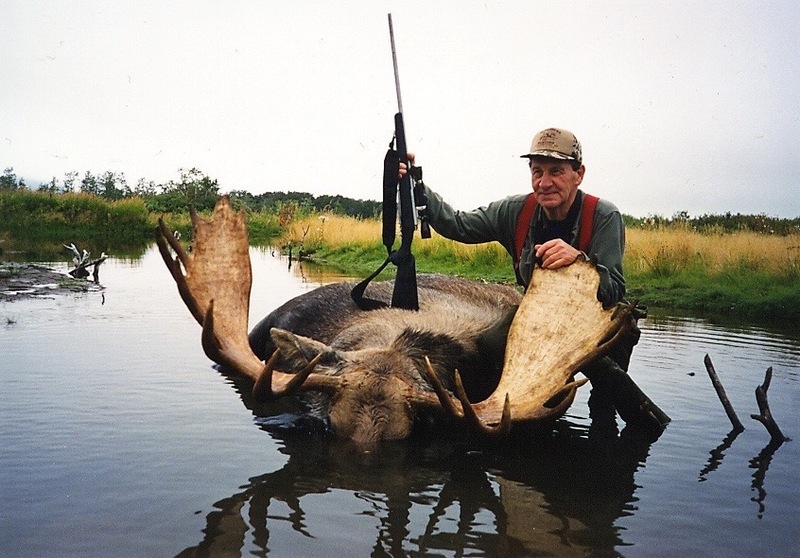 Ralph Papenheim, MN, with guide Truman Grinter with Ralph's moose in a beaver pond in '99. They had help from two packers, Eric Spitzer and Chris Moore. Eric was the one who broke the beaver dams. See the "Packer" story. Dan, Brent and I was guiding Frank Sadlon, WI, when he killed this 8'6" brown bear. Brent was back at camp and we contacted him. He was able to bring the boat down the Dog Salmon River. We were able to roll the bear up the bank and then roll him into the boat. I'm not sure we could have done that with a 10'+ bear. I call this picture "bear in a boat." Brent said he never had a 500 pound bear in a boat before. We skinned the bear back at camp which made it easy. This is Victor Workman's 10'8" brown bear in a small creek. Victor was from MT. My son-in-law Sagen was his guide. Sagen said getting the bear out of the water was one of the hardest things he had ever done. He said it was much harder than skinning a moose in the water, which he did that year. My grandson Greg with his 10'1" brown bear. This picture doesn't look bad but when you have 900 pounds wedged between two two foot banks it's almost impossible to move it. With the help of ropes and the three of us we were able to get him out. This picture shows the mass of a 10'+ bear. You can see the ropes still on his front legs. Jeff Jones, PA, is all smiles with his moose taken in Brent's Alaska Peninsula Area in 2008. Jeff's guide was Jason Lesmeister who handle this one by himself. I saved the best or the worst for last. Rod Bradley's 10' brown bear taken in the spring of 2016. They couldn't get the bear out so they used the sat phone and called the lodge for help. Brent sent Dee and Chris over to help. Rod Bradley, MD, with his 10' brown bear. His guide was Trapper Young. It took four people to get the bear out of the water. Chris Moore packed the hide out. That had to be a heavy load!